The 137th running of the $2 million Kentucky Derby (G1) Presented by Yum! Brands saw one of the most contentious fields in recent history. With the scratch of juvenile champion and morning line second choice Uncle Mo due to a gastrointestinal infection, the race was suddenly wide open with just five of the remaining 19 horses sent off at single digit odds. 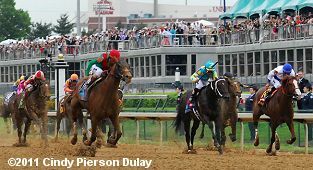 A record crowd of 164,858 crammed into Churchill Downs on Saturday, topping the old attendance record which was set during the centennial Derby in 1974. The weather cooperated, with overcast skies most of the day and temperatures in the mid 60's, but the sun came out in time for the Derby. As expected, Nick Zito trainee Dialed In was sent off as the 5-1 favorite in this 1 1/4 mile classic, off his win in the Florida Derby (G1), which was his 3rd win in 4 lifetime starts for owner Robert LaPenta. 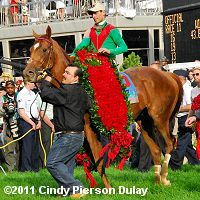 Louisiana Derby (G2) winner Pants on Fire was the 8-1 second choice, with jockey Rosie Napravnik attempting to become the first female rider to win the Roses. 85-10 third choice Nehro drew the unlucky post 19 but moved in to 18 due to the scratch, and comes to Louisville off 2 straight second place finishes in the Louisiana Derby (G2) and the Arkansas Derby (G1) for trainer Steve Asmussen. The longest shot on the board was 39-1 Decisive Moment, demonstrating how evenly matched the field was on paper. Animal Kingdom takes the lead in the center of the track during the stretch run. When the gate opened at 6:31pm, jockey Jesus Castanon angled 23-1 Shackleford in from post 14 to set the pace, and he got easy fractions of 23.24, 48.63, and 1:13.40 while as many as 1 1/2 lengths in front of 36-1 Comma to the Top who pressed him in second, in turn 1/2 a length in front of Decisive Moment third. 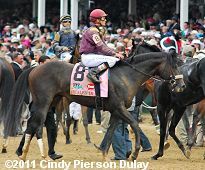 Favorite Dialed In settled near the back of the field early under jockey Julien Leparoux some 18 lengths off the pace. 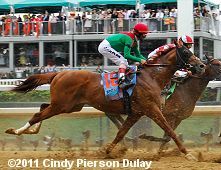 On the far turn, Shackleford continued to lead, getting the mile in 1:37.49, as Nehro, 6th early, moved up to challenge him. 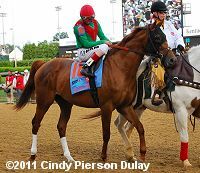 Shackleford led to the 1/8 pole but slowed down, allowing Nehro to briefly taste the lead. However, 21-1 Animal Kingdom, who was 12th early, came out 6 wide into the lane under new jockey John Velazquez, and closed on the leaders easily passing them at the 1/16 pole. He drew off late to win by 2 3/4 lengths in 2:02.04 over the fast track. 9-1 Mucho Macho Man put in a rally from 8th but Nehro held him off by a neck to save second place money. Dialed In attempted to rally but was left with too much ground to make up and checked in 8th beaten 7 1/2 lengths. 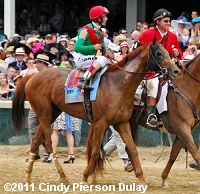 Left: Animal Kingdom heads to the winner's circle led by Barry Irwin of Team Valor. Irwin said, "I've only won a couple of really big ones and when it happens, it's just surreal is all I can tell you. You see it, you know what happened, but it's hard to process. That's my immediate thought. I was tired of trainers lying to me. I wanted a guy who would tell me the truth and Graham was that guy. He had one work in Keeneland where he probably worked a mile in 1:37 when he was supposed to go 3/4, and then our horse went too slow. And then he came here and his dirt work was a real eye-opener and that's what gave us the confidence to go ahead. If he had not done that, we would have skipped the Derby. We would not have run in the Derby just for the sake of being here, believe me." 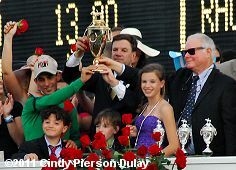 Right: Jockey John Velazquez, trainer Graham Motion, and owner Barry Irwin celebrate with the Kentucky Derby trophy. 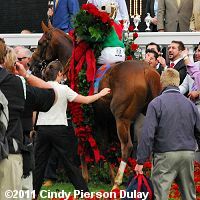 Left: Animal Kingdom in the winner's circle. 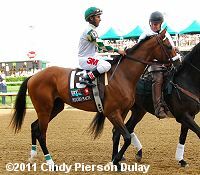 His trainer Graham Motion said, �Once he won the Spiral, Barry and I talked about it and I just said, if we are going to go to the Derby with what I felt was a very light horse, I just couldn't see putting him through another race. We knew he was a very good horse. And we took the conservative route and that's how it worked out and I'm glad we did it and hopefully that will help us two weeks from now. We (Motion and Velazquez) talked last night and in the paddock, and we felt like getting a clean trip was the main objective. That's how it worked out. Someone said 'Are you surprised to win with a second-string horse?' I'm not sure we would categorize him as a second-string horse." Right: Animal Kingdom with his roses. Right: Animal Kingdom heads back to the barn after the race. Left: Animal Kingdom in the post parade. Jockey John Velazquez said, Honestly, this is the race that we all want. Anywhere in the world you go, they are asking you, have you been in the Derby and the second question after that, is have you won it. It's a dream come true for all of us, obviously the jockey and the trainer and the owner. It's definitely one of those things that you have; now I can say I have a check mark on that one. I have that one. Right: Animal Kingdom in 12th place as they pass by for the first time. Left: Second place finisher Nehro in the post parade. 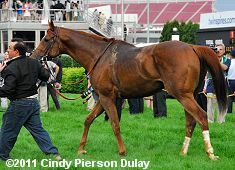 His trainer Steve Asmussen said, "The little horse just ran unbelievable. There was way less pace than I thought there would be and thank goodness Corey was smart enough to take advantage of that." 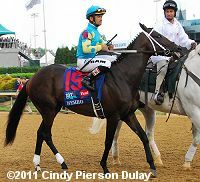 Jockey Corey Nakatani added, "We were in a predicament where I didn't think the pace scenario was as fast as what I needed to be able to get him into a high cruising speed. My job is to sense the pace and to know how fast I'm going and that's why I was where I was. I ended up having a great trip with the outside post that we had. It's difficult when you're out that far to save as much ground as we did. He ran a tremendous race." Right: Third place finisher Mucho Macho in the post parade. 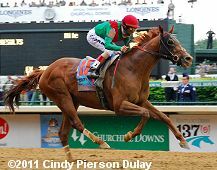 His trainer Kathy Ritvo said, "He's only going to get better, he's only a June 15 foal. He'll come back hopefully in a couple weeks if he comes back good, and we're ready to go. "He was fabulous today. It went just the way we thought it would be. He gave it his all. He finished up well. Rajiv said he finished up well. It was really exciting. When I saw him turn for home and he was running, I was jumping around and cheering him on." 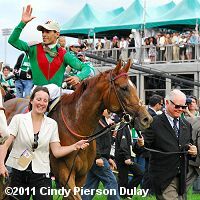 Jockey Rajiv Maragh added, "I had a great trip. My horse gave me a great feeling all around the race track. At every point in the race that I needed something from him, he gave it to me. He ran 110 percent. He kept coming on all the way through to the wire. He ran an amazing race." Left: Eighth place finisher and beaten favorite Dialed In returns after the race. 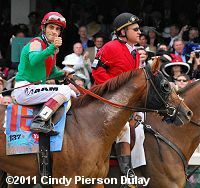 His jockey Julien Leparoux said, "He had a good trip. It went the way we planned it in the back, but they didn't back up to us today." Trainer Nick Zito added, "He was in the back of the pack. He was dead last and they just never came back. They went 1:13 and never came back." Right: The entire field shortly after the start of the Kentucky Derby. Jesus Castanon aboard pacesetter and 4th place finisher Shackleford said, "It was an easier pace than some expected, but we were willing to take it. He led on his own and ran really, really big. I rode him a little bit away from the gate and he did the rest on his own. When they came to me, he picked it up really nice and gave me a good run down the stretch. I'm very happy with his run and he's improving, this horse. He'll be better and better down the road."